Hi, I'm a soup lover too and I would love to share this recipe that was passed down from my Mom. This is one of my favorites and as a single Dad, I can honestly say it is easy enough to whip together after a hard days work. 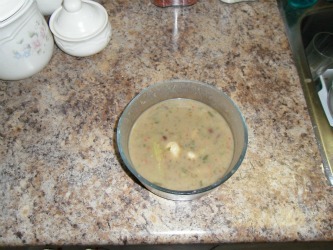 My soup is made with 3 main ingredients which are green collards, potatoes and red kidney beans. 1 large can of red kidney beans drained - but you can use dried beans if you know how. I grab my handy soup pot and fill it half full of water. Then I add a half teaspoon salt, 1 teaspoon olive oil and all veggies I mentioned above. Now bring all those goodies to a boil. Once it boils do medium heat for about 45 minutes. Once the soup is done I like to spruce it up with a little minced red pepper paste. About 1 teaspoon. It is also known as paprika paste. It is a Portuguese thing, what can I say. It's healthy, it's fast and it's simple. Awesome for everyone. Hope you like it. Single Dad but darn good cook. It's nice to see parents still putting in the time to make a healthy meal for the family. The recipe sounds great and I'm definitely going to give it a try. Join in and write your own page! It's easy to do. How? Simply click here to return to Collection of Homemade Soup Recipes.